Magdeburg-Stendal University of Applied Sciences was founded after the German unification in 1992. It has seven departments at two locations with a teaching staff of about 160 professors and lecturers that offer degree programmes to about 6,500 students. Undergraduate training of sign language interpreters has taken place in the Department of Social Studies and Public Health since 1997. The sign language interpreting unit has a staff of two professors, one sign language interpreting trainer and three deaf sign language lecturers. It entertains close links with regional and national organizations of the deaf as well as professional associations of sign language interpreters. The current BA programme in sign language interpreting was introduced in October 2005 and has an intake of 16 students per year. The programme has been formally accredited. Jens Hessmann has been involved with sign language and deafness since 1986. He was a member of sign language research projects at the Free University of Berlin and Hamburg University. From 1995 to 1998, Jens coordinated a project for Deaf students at the University of Applied Sciences in Potsdam. Since 1998, he has been working as a professor at the University of Applied Sciences Magdeburg-Stendal. His specific fields are sign language linguistics, interpretation studies, and the sociology of deafness. Rachel Rosenstock is a sign linguist who studied at the University of Hamburg and Gallaudet University in Washington, D.C. For her 2004 PhD work, Rachel investigated the structure and comprehension of International Sign. 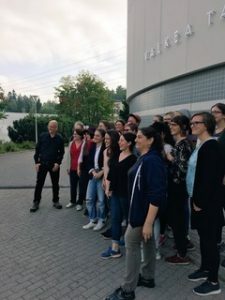 Rachel reinforces the Magdeburg team while being based in the sign language interpreting programme at the University of Applied Sciences in Zwickau. Humak University of Applied Sciences (Humak), founded in 1998, is an expert and a leading educator in the humanities and pedagogy as well as cultural management in the whole of Finland. It operates nationwide in a network of 7 educational units within four study programmes: Sign Language Interpreting, Cultural Management and Civic and Youth Work. There are some 1,400 students at Humak and the number of personnel is about 120. Sign language interpreting training at Humak goes back to 1983 and consists of a four-year Bachelor programme (240 ECTS). All study programmes offered by Humak are made up of the university’s basic studies, programme specific basic studies, major studies, projects, work placements and final theses. Elina Tapio is a Principal Lecturer at Humak University of Applied Sciences, Finland. She is doing ethnographic research on signed interaction with a particular interest in (English) language learning, multimodality, space/place, and multilingualism within the framework of ethnography and Mediated Discourse Analysis. Liisa Halkosaari is a senior lecturer in Interpreting Training Programme at Humak. 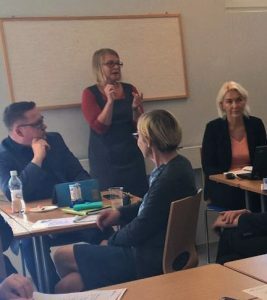 She is currently also the manager of the education project Lev i vårt språk (Live in our language) (2016-2017 and 2018-19) working with the Deaf community to revitalise Finland-Swedish Sign Language. She has BA in interpreting (Diaconia University of Applied Sciences 2002) and MA in Finnish Sign Language (University of Jyväskylä 2013). Outi Mäkelä graduated as sign language interpreter in 1994. She received MA degree in Education in 2001. Outi has been lecturer in Sign Language Interpreter Training Programme at Humak since 2005. Juha Manunen is Deaf Sign Language and interpreting lecturer at Humak. He received MA degree in Education from Jyväskylä University in 2008. In his master thesis Juha analysed plural negation in Finnish Sign Language. Heriot-Watt University has been offering undergraduate training of sign language interpreters since 1996, in association with a much wider range of translation and interpreting courses at undergraduate and postgraduate levels which have been established for over 40 years. The Languages & Intercultural Studies department has recently been further strengthened with the appointment of four new Professors, all leading figures at the global level, and is entering a phase of intensification of its research, policy support and knowledge exchange activities. The department’s Centre for Translation & Interpreting Studies in Scotland works closely with industry and community bodies such as the Scottish Association for Sign Language Interpreters and the British Deaf Association, as well as public authorities, particularly in the legal and medical spheres. The department has been a long-term active participant in the development of the profession UK-wide within initiatives co-ordinated by Signature, the Scottish Council on Deafness and other key bodies. Graham H. Turner is Chair of Interpreting & Translation Studies, Director of the Centre for Translation and Interpreting Studies in Scotland (CTISS) and Director of Research for the School of MAnagement & Languages at Heriot-Watt University. Since 1988, he has been working as a researcher and educator at undergraduate and postgraduate levels in applied sign linguistics, Deaf Studies and sign language interpreting.He is on the editorial boards of the journals Interpreting; Disability & Society; and the Sociolinguistics in Deaf Communities series of collections. His research has included the application of methods and theoretical frameworks developed for the analysis of spoken language interaction to the ‘bimodal’, bilingual context of dialogue interpreting between spoken and signed languages, exploring issues of social exclusion arising from deaf people’s linguistic access to environments such as courts, social care settings, education, and theatre. Jemina Napier is Chair of Intercultural Communication in the Department of Languages & Intercultural Studies at Heriot-Watt University in Edinburgh, UK. Prior to that she was Head of Translation & Interpreting and Director of the Centre for Translation & Interpreting Research at Macquarie University in Sydney, Australia. She is an interpreter researcher, educator and practitioner and has practiced as a signed language interpreter since 1988, and works between English and British Sign Language (BSL), Australian Sign Language (Auslan) or International Sign. After completing an MA in BSL/ English Interpreting at Durham University in the UK, Jemina moved to Australia to undertake her PhD studies in 1998.She established the Postgraduate Diploma in Auslan/ English Interpreting in the Department of Linguistics at Macquarie University in Sydney in 2002, and was head of the suite of Translation and Interpreting programs from 2007-2012. She is also a Research Associate at the University of Free State in South Africa. Jemina has published 3 books, an edited volume and over 40 articles and book chapters based on research on signed language interpreting and interpreting pedagogy. Jemina is a past President of the Australian Sign Language Interpreters Association (ASLIA) and was an inaugural board member of the World Association of Sign Language Interpreters (WASLI). She is Editor of the International Journal of Interpreter Education. Her major research interests are related to signed language interpreting and general interpreting pedagogy, but her wider interests embrace applied linguistics, language and communication, sociolinguistics and discourse analysis. Robyn Dean, CI/CT, MA, was appointed to the faculty of the University of Rochester School of Medicine in 1999, in recognition of her scholarship in the interpreting field and leadership in the education of interpreters, medical students, and other health care professionals. She has been an interpreter for 25 years, with particular service experience in healthcare and mental health settings. Robyn holds a BA in ASL Interpreting and an MA in Theology. Her contribution to interpreter education was recognised in 2008 with the Mary Stotler Award, an award conferred every two years, conjointly, by the Registry of Interpreters for the Deaf and the Conference of Interpreter Trainers in the US. Robyn is currently a PhD Candidate at Heriot-Watt University in Edinburgh, Scotland. Gary Quinn started his academic career as a research volunteer at Bristol University, before moving to the University of Central Lancashire (UCLan) in 2000. His work there included research into Deaf people who have minimal language skills, as well as lecturing on the Deaf Studies degree course. Since 2006 he has worked as a lecturer and researcher at Heriot-Watt University in Edinburgh, teaching on a number of University programmes and, since September 2012, works as programme coordinator for the new undergraduate MA BSL/English Interpreter course. He is also studying part-time for a PhD and his research interests include pragmatics, metaphor, signed vocabulary for science terminology, variation in BSL and the different linguistic strategies used within a signed interaction. Gary has worked as a consultant to a number of British and international organisations and has published a range of articles on the subject of sign linguistics. Svenja Wurm grew up in Germany, but has lived in the UK since 1998. She completed her PhD on translation between written and signed languages at Heriot-Watt University in 2010, and has an MSc in Translation Studies from the University of Edinburgh and a BA (Hons) in Interpreting British Sign Language/English and Linguistics from the University of Wolverhampton.Svenja, now a lecturer in Translation and Interpreting Studies/British Sign Language, joined Heriot-Watt in 2005, where she has been a key figure in developing the first full-time academic programme in sign language interpreting in Scotland. She is co-organiser of the Edinburgh-based EdSign lecture series and co-editor of the publication series The Sign Language Translator and Interpreter. Her research to date, exploring the notion of signed language translation (rather than interpreting), is characteristic of her interests in recorded translation involving written and signed texts, multimodal translation, Deaf and Hearing literacy practices and qualitative methodologies, as well as addressing her more general motivation to encourage exchange between signed and spoken/written language translation, and translation and interpreting scholarship.